Favourable August weather has been kind to guests and staff alike as we enjoy lots of nice flat water on the grounds and warm sunny afternoons back at the lodge! With less than 3 weeks remaining in the season the fishing remains stellar. The Tyee Club continues to grow daily with lots of enthusiastic bell-ringing going on at the dock each evening. Near shore fishing has been particularly productive with steady Chinook catches in tight at Parker Point, from Bird One around to Cape Naden and the Mazzaredo Islands. 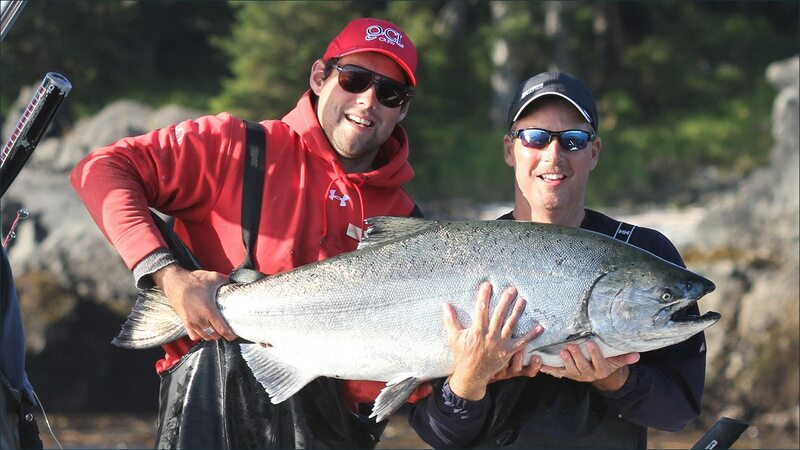 Mark B, fishing with guide Andrew “Fuzz” Simpson became the newest member of the 50 Pounder Club with a stunning chrome fish that they picked up of the east corner at Parker. 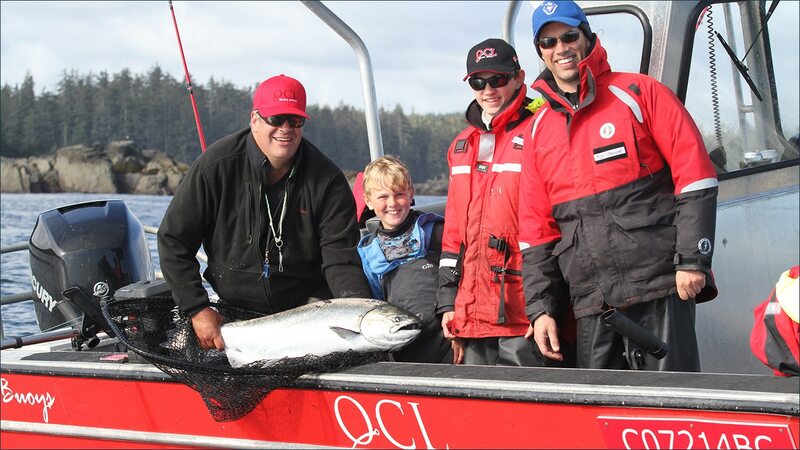 Mark’s salmon taped out to 56 pounds and all were thrilled to see it swim away from the boat to the safety of the surrounding kelp beds. Great job guys! Later in the day, boat mate Larry M released another beauty that measured to 40 pounds! 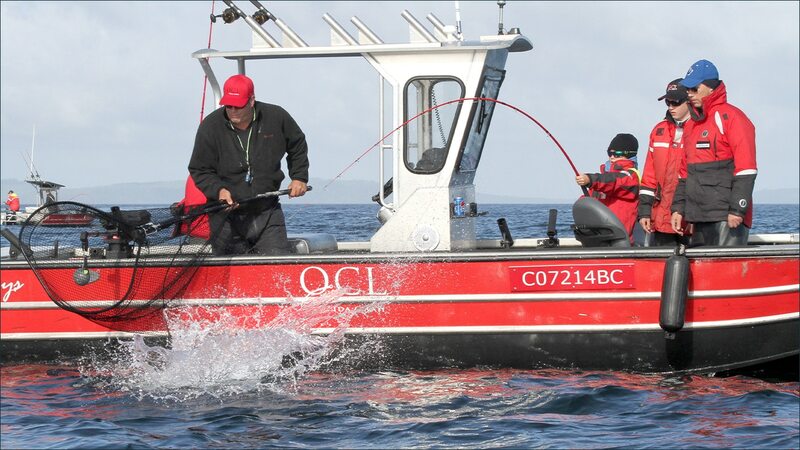 Down at the Mazzaredos veteran QCL angler Ken J played a big Tyee to the boat where his guide Ryan “Cap’n Crunch” Kelly carefully taped it out to 48 pounds before setting it free. 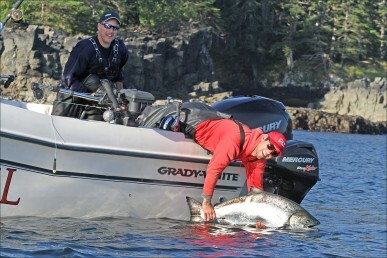 Joe E released a nice 43 pounder on Wednesday and on Thursday long time lodge guest Grant W turned back a 40 and Brett M released a 44 at Parker Point. Wonderful catches guys! While dedicated veteran anglers enjoyed lots of success we had several youngsters doing particularly well off the topside at Eagle Rock. Josh L managed to land 3 Tyees on his first visit to the Lodge including 40 & 41 pounders! Jake L boated 30 & 31 pound Tyees and 8-year old Evan L landed 32 & 34 lb. Chinooks! Some serious fishing skills on display up there! Fly rod-wielding anglers in search of hot and heavy Coho action had their work cut out for them this week. While most anglers are getting their share of nice chrome Coho to take home, they’re really scattered around the grounds and the large schools we’re accustomed to have not shown up inshore at least. 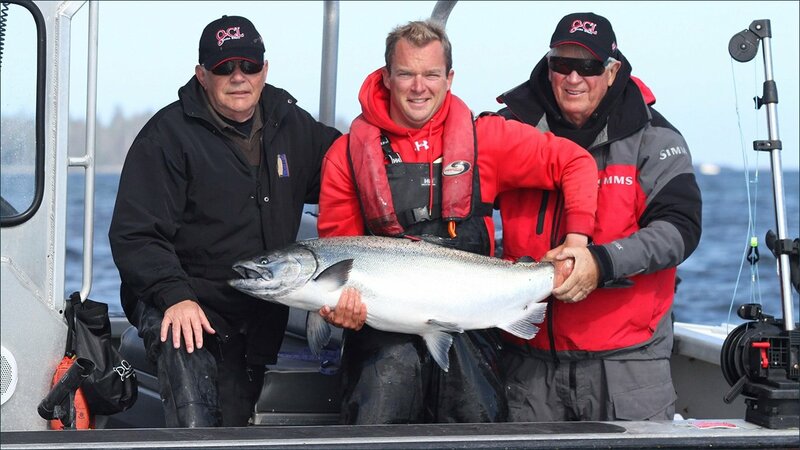 It seems the Coho are running a little later as the average size is still 8-10 pounds and we usually find strong numbers of 10-12’s at this stage of the summer. By Thursday however, the fly-fishers had located the fish they were after and enjoyed success deep in the bays and even managed to land some “teener” Chinooks! On the halibut grounds, it’s taking a little more effort to locate the size of fish that we’ve enjoyed all summer but they’re out there! Lots of teen-sized fish are coming to the scale along with a number of 30-plus. We’re still bumping into a few giants out there – Larry H landed two himself last week – at 104 and 234 pounds! We continue to enjoy moderate winds though the combination of NW 15 and an afternoon ebb tide can make the water chop up nicely! The outlook for the next few days is for mainly west to northwest winds from 10 – 20 knots and some more sunshine!